Transverse myelitis (TM) is a neurological condition that is caused by inflammation of the spinal cord. When the spinal cord becomes inflamed, the insulation barrier around the nerve cells (called myelin) begins to break down. As a result, the communications between the spinal cord nerves and the rest of the body may be interrupted or delayed, resulting in numbness or paralysis throughout the body. Transverse myelitis can be triggered by a viral or bacterial infection, but some suspect that it could also develop as a reaction to a vaccine. The development of transverse myelitis after vaccination is relatively rare, but it has been associated with many different vaccines commonly administered to adults, infants, and children. The most likely vaccines to provoke reactions include inoculation against flu, measles-mumps-rubella (MMR), tetanus-diphtheria-pertussis (TDaP), and the hepatitis B virus. Researchers are unsure if the vaccines themselves provoke adverse reactions, or if they may be caused by a common denominator of these vaccines, such as an additive or preservative. Another theory is that TM is the result of the stimulation of immune cells through vaccination. Transverse myelitis is an autoimmune disorder, and many vaccines are designed to produce immune reactions (most notably the flu vaccine). While a vaccination can stimulate the immune system, it may also encourage the growth of T-cells that attack the myelin sheath, resulting in TM. 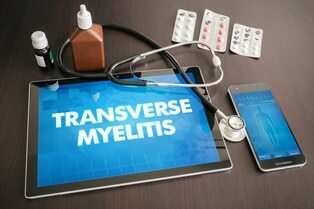 In most reported cases of transverse myelitis, the symptoms occurred anywhere from several days to three months after vaccination, with the majority of patients experiencing only one episode of TM. However, some patients saw periodic recurrences in their symptoms and continued to experience nerve disruption for several years. While patients are typically expected to recover from TM with few lasting problems, some will suffer permanent impairments that can affect their ability to perform self-care, earn a living, or live independently for the rest of their lives. Transverse myelitis may be compensable through the National Vaccine Injury Compensation Program (NVICP). This federal program allows parents to collect payment for vaccine injuries without the need to file a lawsuit. To qualify, injury victims must have received one of the covered vaccines and file a petition within the time limit for compensation. If accepted, the NVICP will provide funds for medical treatment and other losses caused by vaccination. If your petition to NVICP is denied, your best hope for compensation is to file an injury lawsuit. A lawsuit can provide payment for the medical costs of your child’s injury, compensation for disability and future loss of income, pain and suffering, and even pay for the legal costs and fees related to your vaccine injury claim. However, the statute of limitations for filing a vaccine injury claim is extremely limited, so it is best to speak with an injury attorney as quickly as possible about your case. If your child has been experiencing strange symptoms after a vaccination appointment, we can help. Our attorneys can gather evidence on your behalf and fight aggressively to prove that your child’s injury was a direct result of vaccination. Call us today to schedule a free, no-obligation consultation with one of our attorneys, or take a moment to fill out our online contact form.